Star kids Jhanvi Kapoor and Ishaan Khattar are all set to make their debut in the entertainment industry with their upcoming movie Dhadak. Slated to release in July 2018, Dhadak is said to be the remake of hit Marathi movie ‘Sairaat’. Jhanvi Kapoor And Ishaan turned on the charm at Dhadak poster launch. 2018 looks quite a year for the newer generations of the tinsel town! If you’re still wondering about the star-kids tag, well, Jhanvi Kapoor is the eldest daughter of Boney Kapoor and Sridevi and Ishaan Khattar is a brother of Shahid Kapoor. 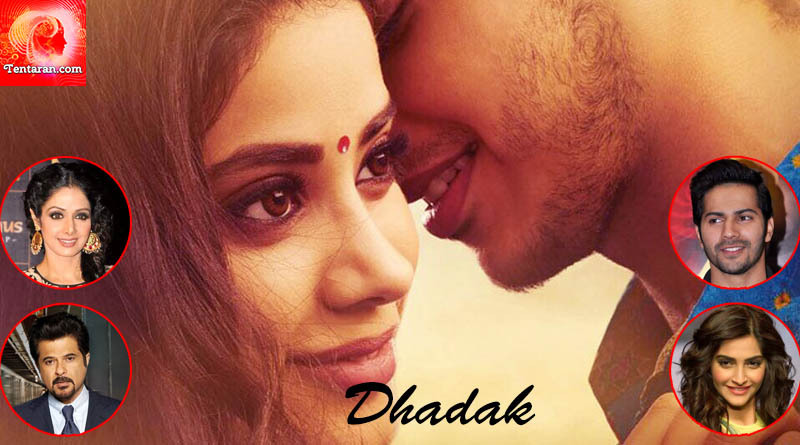 A collaborative venture of Zee Studios and Dharma Productions, “Dhadak” is going to be directed by Shashank Khaitan, who is “the master of heartland romance and creator of the Dulhania franchise”. The movie will be hitting the floors on July 6, 2018, and is expected to be a mega blockbuster being the debut movie of Sridevi and Boney Kapoor’s daughter! It’s not a debut movie for Ishaan though, he had earlier starred in Beyond The Clouds by Majid Majidi. The poster released by Karan Johar, who seems evidently unfazed by all the nepotism talks is indeed interesting! The comment section is filled with comments saying, “The King of Nepotism is back!”, but well, who cares! The twitter-junta, however, had a mixed response to this poster-release! While the movie buffs are really excited and are loving the chemistry between the fresh couple, there are others who couldn’t keep themselves from talking about how Karan goes around promoting the star kids at every single opportunity! Talking about the posters, they sure look promising, vibrant and fresh! And Jhanvi indeed carries the same elegance that Sridevi has! So, it seems like the wait for seeing some fresh talent from the tinsel town is not a long one! Saif Ali Khan’s daughter Sara Ali Khan’s debutant venture Kedarnath will be releasing in December 2018 while we will get to see the Kapoor daughter much ahead of it in July 2018! ← What should you eat after workout?